The MIT Department of Biology promotes diversity and inclusion as one of our core values. We welcome and encourage talented individuals of all cultural and ethnic backgrounds, sexual orientations and gender identities, and individuals with disabilities, to participate in the Department’s teaching and research endeavors. One of our strengths is a diverse community of scientists, trainees, and staff who share a vision focused on education and discovery, who treat each other respectfully, and who value the contributions of each person. Together, we work to understand the foundations of life, and to bring new knowledge to bear on some of the world’s most difficult and pressing problems related to human health, energy, food, and the environment. We advance our collective pursuit of intellectual, creative, and technical excellence by recruiting talented thinkers and doers from all backgrounds and experiences to contribute distinct perspectives and skills. 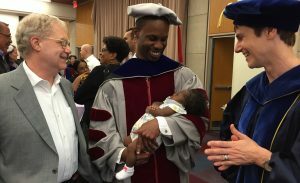 The Biology Department continually strives to increase the number of underrepresented minority faculty, students, and staff in our community, and to ensure that all feel welcome. In addition, we continually work to make our community accessible to all qualified individuals. In partnership with the university, we place high value on creating and maintaining a supportive environment for studying, working, and living that promotes physical and mental well-being and allows each individual to reach their full potential. MIT’s Summer Research Program in Biology (MSRP­-Bio) is a 10-week research-intensive summer training program, available to non-MIT undergraduates. Students perform research under the guidance of graduate student and postdoc mentors, and meet weekly with faculty for seminars and Q&A sessions. Many of our MSRP-Bio alumni go on to successful careers in STEM and medicine; some do their graduate or postdoctoral research in our department or in other programs at MIT. One former MSRP-Bio student who earned his PhD from MIT Biology is now a faculty member in the department. The Quantitative Methods Workshop is a week-long workshop in early January that introduces faculty and undergraduate students from our partner institutions to the methods, quantitative tools and programming languages used to analyze data in biology and neuroscience. As a result of attending the workshop, many of our partners have added quantitative training to their curriculum, and students have modified their course plans to include computer science courses. The LEAH Knox Scholars Program is a five-week summer lab program for low-income high school students in Boston and Everett, providing hands-on lab experience and mentorship. Its mission is to provide a foundation for science education in college and beyond..
MIT Field Trips bring local high school science teachers and their students to the department for a day of lectures and hands-on activities. High school students meet graduate students and realize they too can become scientists. The Summer Workshop for Teachers is a one-week workshop for high school science teachers in the greater Boston area, combining lectures and hands-on laboratory courses. This enables teachers to develop new curricula and incorporate modern biology investigations into their own classrooms. 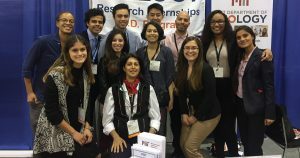 In addition to these programs, we reach out to undergrads through campus visits and national conferences such as the Annual Biomedical Research Conference for Minority Students (ABRCMS) and the Society for Advancement of Chicanos/Hispanics and Native Americans in Science (SACNAS) meeting. We also partner with the Massachusetts Biotechnology Education Foundation (MassBioEd) to host professional development workshops for New England middle and high school teachers. We want to make it possible for all passionate young researchers to apply to graduate school at MIT. All students in need are eligible for an application fee waiver. Please check the Graduate Admissions website to determine if you are eligible. It’s not enough to recruit diverse scientists to our department; we also need to ensure they thrive once they arrive on campus. Student advisors are here to help! In addition, there are many departmental and Institute resources dedicated to ensuring your success at MIT and to help you navigate any challenges that arise. 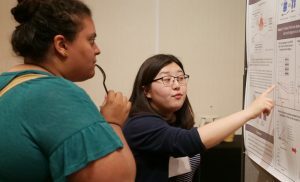 In 2018, biology graduate students launched the Biology Diversity Community (BDC), a cross-disciplinary, student-driven group that fosters peer support for underrepresented students that unites a network of individuals throughout the biology community. The BDC focuses on creating a space for individuals and groups to communicate their varying perspectives in the MIT and broader scientific communities, and to discuss how to navigate barriers as graduate students. Below is a sampling of groups dedicated to diversity and inclusion around the Institute. Additional committees can be found on the Institute Community and Equity Office website, in addition to a list of MIT’s officers, directors, managers, and diversity representatives. Read about MIT’s view on an array of diversity-related issues from the perspective of President L. Rafael Reif.